Spring has sprung in Eliot and visions of sunshine and warmer weather permeate my daydreams. As I look at all the articles in the Spring issue of Eliot News, there seems to be a lot about dreams both hoped for and fulfilled. Two local churches, one dreaming of a neighborhood with less social and racial barriers and more unity, and the other hoping that a recent wave of development doesn’t end its decades long residency in Eliot. Next, there are the two new restaurants both owned by women which have come into Eliot and also just outside our neighborhood’s boundary. Additionally, there is a theater that is bringing high caliber theater while bringing the diverse population of Northeast Portland together to share the complexity of shared human experience. And a music and dance school that helps empower kids by acting out their dreams of being super heroes, ballerinas and rock stars. The Eliot Neighborhood Association has dreams too. We envision a clean, well-cared for neighborhood with residents showing their pride in the place they live by getting rid of trash and debris around each business and residence. There are opportunities to work together during the new litter pick up events and also to feel good about purging all that unwanted “stuff” from your garage or attic at the annual Neighborhood Clean-up on May 22. It’s the one fundraiser and proceeds to go fund neighborhood projects. We also would like to look to the future and work on breaking down the barriers of our different backgrounds and experiences by sharing stories with one another. Just stopping to talk with a neighbor you haven’t met before is a great first step. Or watch for our panel discussion that is in the planning stages for a deeper conversation. If we all work together, Eliot’s dream of a cleaner, closer knit community could come to fruition just like the dreams of so many people sharing their stories in this issue. If you have a story to share, please email or call me so we can include it in an upcoming issue. Email stories, letters, and photos to news@eliotneighborhood.org. 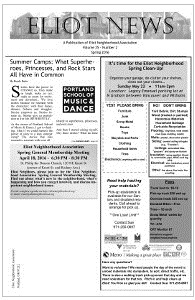 Look for the Eliot News in your mailbox this week! Articles mentioned in this post will be posted online over the next month. Watch for them!